One of the former Prime Ministers Mahathir declared the North-South Expressway open on 8 September 1994. The road goes from the deep South (Johor Bahru) to the Thai border. The Projek Lebuhraya Utara Selatan (Plus) was charged with the building and the maintenance of the expressway. In return for financing and building the highway, Plus holds the right to collect a toll, an average of 7.5 Malaysian cents per kilometer until the year 2018. The building of the North-South Expressway (NSE) costed about MR $6 billion. The 848-km NSE comes across eight Malaysian states. Along the entire West Coast of the Peninsular. The southern track cuts through paddy fields, oil palm estates and pineapple plantations, while the northern one passes fantastic granite hills, with massive rocks lining both sides of the expressway. Specially around Ipoh. North-South Expressway Northern Route (E1) - North�South Expressway (NSE) Northern Route, is the northern part of Malaysia's longest expressway, the North�South Expressway. It is situated on the west coast of Peninsular Malaysia, linking the northern states of Kedah, Penang, Perak and Selangor. The NSE Northern Route begins at the Malaysian-Thai Border (the town of Bukit Kayu Hitam in Kedah state) in the north, where it connects to the Phetkasem Road in Thailand. Its southern terminus is at the Bukit Lanjan exit in Selangor. North-South Expressway Southern Route (E2) - is the southern part of the North�South Expressway. 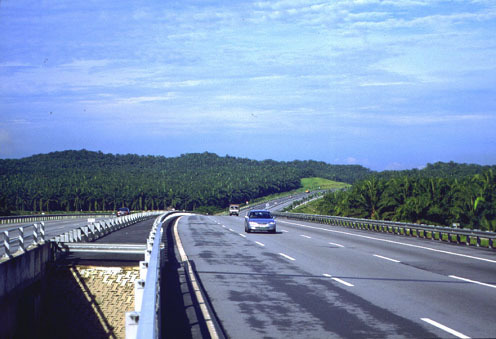 The expressway is oriented in a north�south direction, traversing four states in Peninsular Malaysia; namely Selangor, Negeri Sembilan, Malacca and Johor. The NSE Southern Route begins in the southern part of Kuala Lumpur, at Sungai Besi. Its southern terminus (Kilometre Zero) is at Pandan, Johor Bahru.The NSE Southern Route begins in the southern part of Kuala Lumpur, at Sungai Besi. Its southern terminus (Kilometre Zero) is at Pandan, Johor Bahru. New Klang Valley Expressway (NKVE)(E1) - refers to a stretch of the North-South Expressway in Peninsular Malaysia which starts from Bukit Raja near Klang town, and ends at Jalan Duta in Kuala Lumpur. It is a busiest expressway in Klang Valley during rush hour from/to Kuala Lumpur. The Kilometre Zero starts at Bukit Raja Toll Plaza at Bukit Raja near Klang. The official name as stated on the website of PLUS Expressways Berhad is "the highway concessionaire". ELITE Highway (E6) - This is the most important expressway in Malaysia. 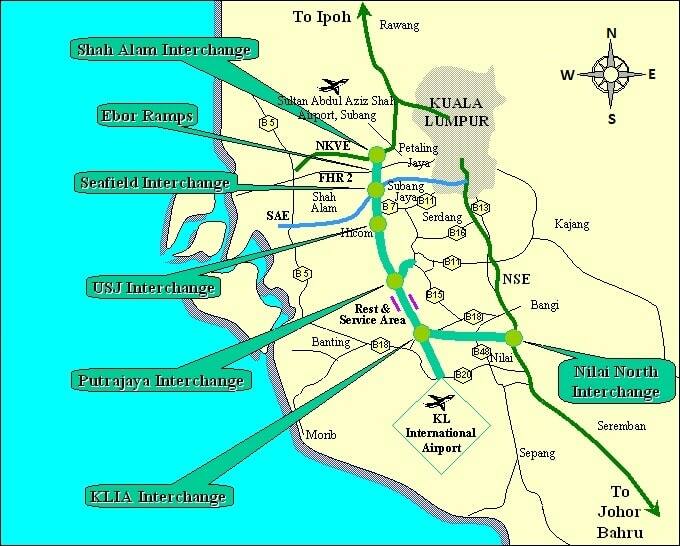 The 60 km of the expressway starts from Shah Alam Interchange EXIT 601 until Nilai North Interchange EXIT 612. This expressway is still within the North South Expressway network and it is a critical link for the North-South Expressway providing northbound and southbound travellers with an uninterrupted journey bypassing the city congestion in Kuala Lumpur. The thick line is the Elite Highway. Also a piece of the NKVE. 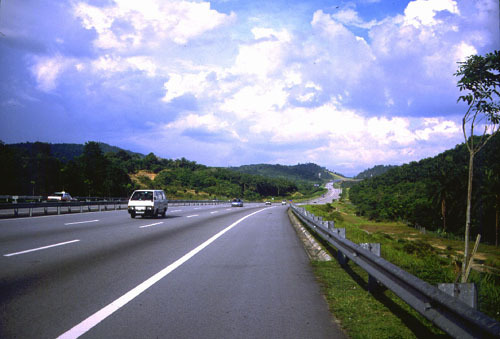 With the North South Expressway (NSE), motorists have a well-paved route from Johor Bahru to the border of Thailand. The following are approximate distances & suggested driving times in good conditions by experienced drivers from Kuala Lumpur and Johor Bahru. If you travel from South to Northern part of Malaysian peninsular, you could bypass Kuala Lumpur (KL) city centre by making exit at Nilai (just after Seremban, capital city of Negeri Sembilan state). NKVE. NKVE would link you with NSE which would save you some time, that is if you have no intention of going to KL. Further north the 30.3 km stretch between Tapah and Ipoh is the most expensive (MYR$20 million), the most scenic, and the most dangerous, with climbing roads and horse-shoe bends. Good for the keen drivers but be wary of your fellowmotorists and trucks. There are 18 rest and service areas, located every 50 to 100 kms, with facilities like food stalls, toilets, parking and telephones. Some even havesouvenir shops and produce markets. There are plans to build motels at the Rest Area's along the scenic northern track. Do not panic if your car should breakdown. There are emergency phones located every 2 km. The highway company (PLUS) runs a 24-hour emergency service. Only they are allowed to do repairs on the highway. These mechanics in yellow PLUS vehicles do free minor repairs, recharge batteries, and can take your car to the nearest RSA if major repairs are needed. Exits to the main towns are generally on the left, watch out for signs placed 1 km and 500 m prior to the turn-off.